Subject: Mechadrome - New Kickstarter Launched!! Should be fine as far as I know.. there have been 30 pledges so far so it must be working maybe they were in the middle of a late night server update or something before. Subject: Re:Mechadrome - New Kickstarter Launched!! Is amazon payments fixed? What was the issue? I'm looking to pledge today. or tomorrow... or soon. It started working again for me after a few minutes, it was a just a 'website is down' error. Gon' git me some robots! GangFightGames wrote: Also, what I plan to do in the pledge manager is have a custom mech option, where you can pick whatever weapons you want.. so if you don't like the payloads I have preset for the pilots, you can just make your own from scratch. This is great, since I'm not sure which close combat weapons I want! Looking forward to seeing more pictures when you have the physical casts of the medium mechs. Do you know when those are expected (just the metal masters)? jackhammers and drill bits for mine then! I wish there were some top mounted options to work in hand to hand. Barzam and I were both discussing having nothing but angry construction machines slapping the crap out of each other. At first I was going to have the wrecking ball be a crane arm that goes on top, but then I thought it would be more fun as a retractable fist kind of weapon, so you can swing the ball like a flail, or shoot it at someone's face. Are all the arms going to be available for either left or right hand? Or just for one hand or the other? I think it might be too expensive for you to have every arm option for both left and right, but maybe they attach farther down on the arm and thus the same bit works for either side (with the exception of the fist). For the light mechs, the weapon and the upper arm are all 1 piece, the medium mech arms break off at the elbow, but those peices are bigger in genereal, so it all comes out even in the end. So, the light mechs will have the left & right versions of full arms, and the medium mechs will have left & right but just the forearms, or 2 of the same universal weapon for the guns that can go on both sides. I'm actually not making much of a profit off of the extra weapons, I'm just offering them as a curtsey to the folks that want them.. I think most people will be in it for full mechs. The retail price for a weapon pack would end up being in the $30-40 range, and I think that's too expensive personally So I'll probably just be selling the weapons on my website and in the campaign, and the retail products will just be the full mechs and starter sets. I think just selling the weapons on your website (not in packaging) is a very good idea, as I don't think they could be profitable on their own. Another idea to make them cheaper- make it like $5 apiece. That's expensive, but it's less than getting a whole pack. I think $5 for a weapon is somewhat reasonable... I can't imagine it would need to be higher. If there was the option to buy individual weapons, I might actually be spending a bit more- I just don't need a pack with every single option (rather, I need like 6 of one option). I think you should do whatever makes the best financial sense for you in this regard, just putting out an idea since you'd also mentioned the idea of possibly selling single weapons on the website in the KS comments. Yep, I could do individual weapons too. I'll have to see how the store software works, but worst case I can just handle it like bitz orders the way GW used to in ages long past. Sure, the more the merrier! In other news, we funded this morning! woohoo! Next stretch goal will be $7000, and will unlock 3 new poses for the Terran Light Mechs. Since there are 4 light mechs per team, this will give each mech their own unique pose. Congrats on funding! I really like setting a smaller, more manageable goal that can fund quickly- gives people confidence in the project. Comparing it to the last, it also passed this point much more quickly this time around, and is much better organized. Well done! I also am impressed by your "leaving money on the table" by not offering extra weapons yet, but asking folks to wait to add them via the webstore after the campaign. This is a wise decision from a logistics standpoint, I think, as it makes the add-ons in the campaign itself much simpler (right now, just light and medium mechs, the rules and cards, and the starter sets). What I think I'm going to do for the arms is make it where you can just select which arm you want like any other product.. each one would get it's own product listing, pretty much all for $5 each, and then do a 6-arm bundle for $25, and you'll be able to select the arms you want with little dropdown menus. Turrets and booster jets would be sold separately too, those will probably be $3 each. A 6-arm bundle for $25 in the webstore is perfect, I'll go ahead and set that aside in my Paypal account! Sorry if you already answered this somewhere Necros, but did you already say if you knew when the first casts of the mediums mechs would come in? I probably won't have them till next week. Email I got today was they are finishing the last master mold "this week". There were some edits they had to do to the original prints to get the casts to come out right so that ended up slowing things down. TalkWargaming.com interviewed me about Mechadrome, if you'd like to know more about the game and where it came from, check it out! Who doesn't love Mechs? The idea of taking control of a giant walking death machine is sure appeal to many. With recent titles such as Titanfall and Transformers (not strictly mechs but they are big, mechanical and killy) helping to build their fan base it seems to be the perfect time to bring them to the Wargaming table. This is where Mechadrome comes in, a 28mm tabletop game which pits rival teams of Mechs against each other in an arena style setting. 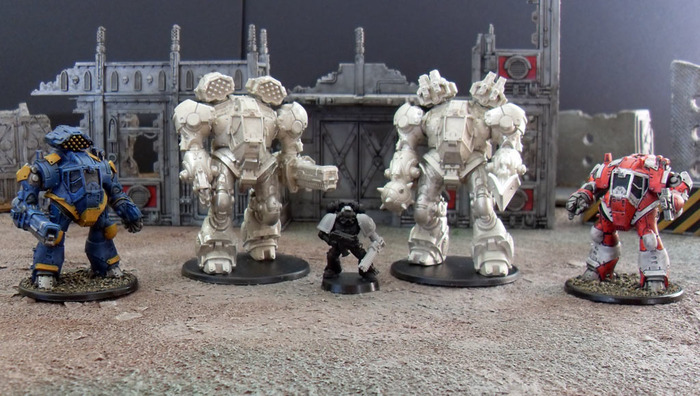 Mechadrome, by Gangfight Games, is currently receiving funding via Kickstarter and I (PH) caught up with Tim Kline (TK) to find out more about the game. I don't back many campaigns, but I think the mechs are cool enough, so I put down $30 for one of the medium ones. Looks nice and chunky and would make a great painting project. Thanks And they're definitely fun to paint. I'm mostly doing them fairly clean looking for the teams, but they'll look great with lots of weathering too. I'll probably do some free agents that look more beaten up. Here's today's weekly update! I'm going to plan to do an update every Monday going forward, now and after the camapign, with everything that's been happening lately. We've had quite the week here being funded so quick and lots of things in development. This coming week should be pretty productive too! Tomorrow I'm expecting the medium mech samples to show up. I'm going to build them right away and get some photos so we'll finally have real-world comparison shots of the 2 different Terran models. Then I'll dive into painting and I should have the terran mediums painted up this weekend, with Team Bushido a few days later. I probably won't have enough sample pieces for bodies for every mech, so I'm going to magnetize the arms and use the same bodies for each photo for now. Jonathan Peace just finished writing the bios for each pilot, so I will be posting that soon. I want to get the models painted first and then I'll do an update with all of the bios and photos I have. I'm also going to hold off on posting the pilot card PDFs till I get the new models painted up. Don't want to just update the PDF a week later and make people feel like they have to print them twice. I mentioned before that I ordered up prints of the other 3 light mech poses and the hazards that were going to be for the next 2 stretch goals. I decided I may as well just get the molds and everything all done anyway since I'm getting the prints done. So, when I have a chance to update the menus later I'm going to be removing the goals for the alt poses and hazards. The $10k goal for free hazard models will stay though. So the Arena Hazards will be add-on items, $10 each for a pair of hazards or objective markers, and then the first stretch goal will be the $10k free hazards goal. Unfortunately I just can't afford to lower that goal as much as I'd like to. Thanks for the update, can't wait to see pics of those medium mech samples! The Medium Mech samples showed up today, and here are the photos as promised! These are metal master samples, and were pretty heavy and tough to work with, but I managed to file down the very few spots of flash. I attached the arms with poster putty and they were too heavy and kept falling off. I'll glue them on when I paint them. Of course none of that matters since the final models will be resin and very light and easy to work with! So, from left to right, we have Buzzkill, Disorder, Makuzo and Tusragowa.. and the obligatory space marine for size comparison. Over on the campaign page I have some close up shots and rear views, check em out! Heck yeah! Do you have a pic with the drill and left/right fist arms?